(Nanowerk Spotlight) Advances in micro- and nanoscale engineering have led to various mobile devices that either can move on solids (see: "Nanotechnology reinvents the wheel") or swim in fluids (see: "Self-propelled microrockets detect dangerous bacteria in food, clinical and environmental samples"). Researchers are applying various strategies to designing nanoscale propulsion systems by either using or copying biological systems such as the flagellar motors of bacteria or by employing various chemical reactions. Different practical micromotor applications, ranging from drug delivery, to target isolation and environmental remediation, have thus been reported over the past 2-3 years. Yet, there are no reports on a nanomachine-based toxicity assay approach, analogous to the use of live aquatic organisms for testing the quality of our water resources. Until now. In new work, Joseph Wang, a Distinguished Professor in the Department of Nanoengineering at UC San Diego (UCSD), and his team, took advantage of recently developed biocatalytic – enzyme-powered – tubular microengines that offer efficient propulsion in various real-life media and on well established enzyme inhibition processes. Reporting their work in the December 12, 2012 online edition of ACS Nano ("Artificial Enzyme-Powered Microfish for Water-Quality Testing"), the researchers describe a new simple and cost-effective nanotechnology strategy for water-quality testing based on changes in the propulsion behavior and lifetime of artificial biocatalytic microswimmers in the presence of aquatic pollutants, in a manner analogous to changes in the swimming behavior and survival of natural fish used for toxicity testing. 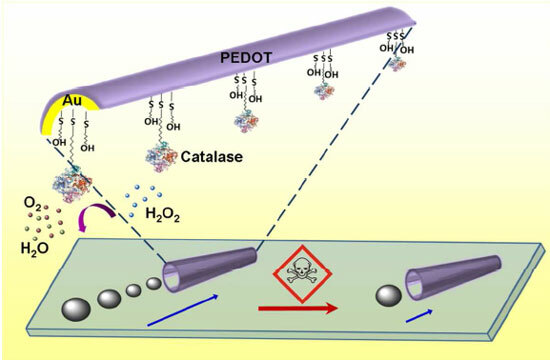 "Our new micromotor toxicity testing concept mimics live-fish water testing and relies on the toxin-induced inhibition of the enzyme catalase, responsible for the biocatalytic bubble propulsion of tubular microengines," Wang explains to Nanowerk. "The basis for this exciting development is thus the influence of the toxin upon the activity of the enzyme powering the micromotor, and hence upon the propulsion efficiency and survival time of such artificial biocatalytic microswimmers." The novel nanoswimmer water-toxicity assay strategy addresses drawbacks associated with fish-toxicity assays, including standardization and reproducibility problems, and major ethical concerns associated with live-fish toxicity bioassays (one of the oldest and most widely used approaches for testing the quality of our water resources relies on changes in the swimming behavior and lifetime expectancy of live fish in the presence of toxic substances). The researchers fabricated their artificial microfish by a template-based electrodeposition of PEDOT/gold bilayer microtubes. These have a defined conical microtube configuration, with a length of ∼8 µm, outer diameters of 2.0 and 1.2 µm, along with inner openings of 1.6 and 0.8 µm. The microengine-based water toxicity testing developed by the UCSD team relies on changes in the propulsion behavior associated with the inhibition of the catalase biocatalytic layer by common pollutants. The biocatalytic decomposition of the hydrogen peroxide fuel at the inner enzymatic layer of the microtube generates the oxygen bubble thrust at the tail of the fish and leads to an efficient swimming motion of the microfish. However, if this device encounters chemical stress – for instance heavy metals, pesticides or herbicides – the biocatalytic activity of catalase is inhibited and results in a lower bubble frequency and an impaired locomotion of the artificial microfish. Wang notes that the optical tracking of the movement of the artificial microfish thus offers a simple and direct real-time visualization of these toxin-induced changes in their swimming performance. "Unlike earlier motion-based biosensing applications involving the attachment of bioreceptors, no additional surface functionalization is required for realizing the microfish-based water-quality testing," he says. " In addition, the composition of our enzyme-powered polymer-based microengines makes these microfish highly compatible and environmentally friendly."